The root contains "filicin", a substance that paralyses tapeworms and other internal parasites and has been used as a worm expellent. It is one of the most effective treatments known for tapeworms - its use should be immediately followed by a non-oily purgative such as magnesium sulphate in order to expel the worms from the body. An oily purge, such as caster oil, increases the absorption of the fern root and can be dangerous. The root is harvested in the autumn and can be dried for later use, it should not be stored for longer than 12 months. This remedy should be used with caution and only under the supervision of a qualified practitioner. The root is toxic and the dosage is critical. See also the notes above on toxicity. The root is also used in the treatment of dandruff. Woods, hedgebanks, wet heaths, shady rock ledges and crevices. Young fronds - they must be cooked. Harvested in the spring and baked. 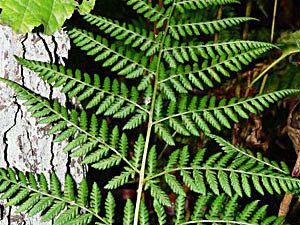 An infusion of the fronds is used as a hair rinse and to treat dandruff. The leaves can be used as a packing material for fruit etc. Plants can be grown as a ground cover when spaced about 60cm apart each way. Spores - can be sown at any time of the year in a greenhouse. Surface sow on a sterilised compost and keep moist, possibly by placing the pot in a plastic bag. Germinates in 1 - 3 months at 20�C. Pot up small clumps of the plants when they are large enough to handle and grow on in a shady part of the greenhouse until large enough to plant out. Division in spring. Larger clumps can be replanted direct into their permanent positions, though it is best to pot up smaller clumps and grow them on in a cold frame until they are rooting well. Plant them out in the spring. 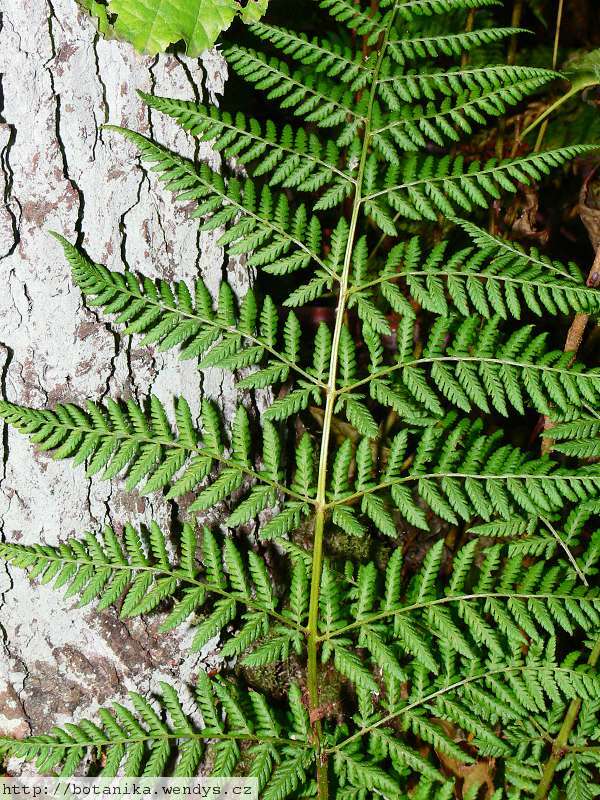 Although we have found no reports for this species, a number of ferns contain carcinogens so some caution is advisable. The fresh plant contains thiaminase, an enzyme that robs the body of its vitamin B complex. In small quantities this enzyme will do no harm to people eating an adequate diet that is rich in vitamin B, though large quantities can cause severe health problems. The enzyme is destroyed by heat or thorough drying, so cooking the plant will remove the thiaminase. However, there have been reports for other species of ferns suggesting that even cooked fronds can have a long term harmful effect. Some caution is therefore advised.